When we create artwork for print it’s important for us to understand a little about the process that the artwork goes through when it’s printed. Once the file has been separated it can be etched into solid metal plates. The printer has four rollers and a metal plate is attached to each, one roller per colour. Paper or card is feed into the printer and rolls down on a sort of conveyer belt under the rollers in turn picking up one colour at a time. Sometimes modern printing presses will offer Digital Printing. Unlike the above method the colours are accurately sprayed onto the paper or card through tiny nozzles. It’s still important that the colours be separated and that they are applied in the correct order. If you have an inkjet printer at home you can often see this process yourself by opening the ink cartridge door while the printer is working. 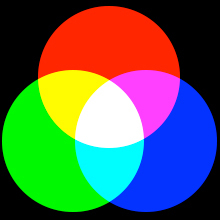 White light is made up of equal amounts of red green and blue. We can mix these three colours of light to get the whole spectrum. As white light hits certain objects some of the colours in the light are defused and what’s left over reflects and makes the colour of the object you’re looking at. White light (made of red green and blue) hits the magazine. 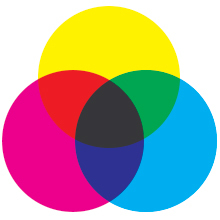 The yellow magazine defuses the blue light and the remaining green and red light mix to form yellow. Using CMYK inks allows us to defuse light in the most effective way. When we mix CMYK inks or paint it increases the amount of colours that the light defuses and reflects less making the colour darker and closer to black. As you can see the centre of the diagram is not pure black which is why we add pure black as a separate colour when printing. Screens on the other hand use Red, Green and Blue (RGB) directly since there it doesn’t need to defuse anything. The more colours in an RGB image the closer it gets to white. White light (made of red green and blue) comes from the screen. The Screen turns down the blue light. The remaining green and red mix to form yellow. What that means when printing If an image starts off as RGB it’s going to have to be converted into CMYK in order to go through the printing process and because the colours are mixed from different sources the Image will never look exactly as it did on screen though we can get pretty close.